Kathryn is a former solicitor who saw the error of her ways. She quit her job and sold her house to study medicine; let’s hope it works out for her. Breen KJ, Cordner SM, Thomson CJH, Plueckhahn VD. 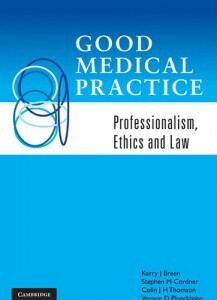 Good Medical Practice: Professionalism, Ethics and Law. Port Melbourne: Cambridge University Press; 2010. Anyone brave enough to write a textbook about Australian law quickly runs into an almost insurmountable obstacle: federalism. In effect, Australia has nine jurisdictions. The number of activities that are illegal in one jurisdiction (usually Queensland) whilst positively encouraged in another (usually the ACT) is myriad. Producing a textbook for a national audience that covers these jurisdictional variations comprehensively without boring the reader senseless is a challenge. Not satisfied with simply exploring the complexities of the Australian legal system as it affects medical practice, however, the authors of Good Medical Practice: Professionalism, Ethics and Law decided to examine ethics and professionalism as well. Drawing together these three systems that govern appropriate conduct was surely a Herculean task, but it has resulted in a thoroughly readable and useful book. The authors’ decision to combine ethical, legal and professional principles has allowed them to distil key concepts and provide comprehensive, practical guidance without overwhelming the reader. For example, a chapter on the complex legislative regimes surrounding the issue of privacy could usually be expected to leave the reader confused, or possibly even sobbing. Here, the heavy legal content of the chapter is rendered almost redundant by the authors’ perceptive preface that doctors who adhere to ethical principles of preserving patient confidentiality are unlikely to fall foul of privacy law. If you choose to stop reading after that point is made, you probably already know enough to avoid a major problem. This “all-in-one” approach acknowledges the interaction between law, ethics and being a good doctor. It is the key to the success of this book. Complex legal and ethical ideas are conveyed succinctly, within the framework of practical advice on how to conduct oneself professionally. The authors’ tips on preventing unfortunate outcomes – such as formal complaints, lawsuits or drug-fuelled meltdowns – are sensible and worth reading even if you skip just about everything else. 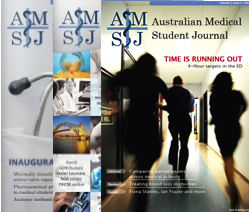 First-year medical students and international graduates will find the chapter explaining the ins and outs of Australia’s health system valuable; a chapter on the professional responsibilities and regulation of other health care workers is also useful for those experiencing their first exposure to multi-disciplinary teams. Chapters covering issues relevant to clinical research, prescribing, entering practice, and the ethical allocation of health care resources are likely to be useful to later-year students and junior doctors. There are a few problems with the text, however. For example the chapter on the Australian legal system appears towards the end of the book. I’d suggest reading it first, to avoid confusion when legal terms are encountered. In addition, unfortunate timing has meant that the chapter on the regulation of the profession does not address the new regime of national registration, but the general principles it outlines are still relevant. Overall, the book is well-structured, easy to use, and succinct without sacrificing clarity. For those who would like more information, there are some good resources suggested at the end of each chapter. For the most part, however, it will be unnecessary to consult an additional text if one requires simply a good working knowledge of relevant ethical and legal principles. It is perhaps disappointing that a book exploring ethical concepts is not more thought-provoking (in this line, I’d recommend Annas’ excellent, if somewhat dated, book ), but it seems that the authors have elected to guide rather than challenge their readers. In this they have been successful. In short, Good Medical Practice delivers exactly what its title promises: succinct information about the ethical and legal responsibilities of medical practitioners (and students) within a broader professional context. The intended audience of medical students and junior doctors is likely to benefit from some time spent reading this book. Annas GJ. Standard of Care: The Law of American Bioethics. New York: Oxford University Press; 1997.